For the last couple of weeks, cruel person that I am, I’ve more or less banned myself from reading. Ivory Terrors needed finishing, and then more recently, I needed to prepare for the launch – May 1st, this coming Thursday, in case anyone is in danger of forgetting. It’s surprising how much time doing the final read-through and formatting, requesting reviews, and organising a blog tour takes up. When I’m actually writing, other people’s books inspire and motivate me. When I just need to get my head down and get everything perfected and organised, they risk getting in the way. I decided I needed my imagination firmly inside The Cavaliers, and not in someone else’s world. This self-imposed denial was made rather easier by the fact that my beloved Kindle broke a month or two ago. It’s much simpler to resist the lure of an intriguing novel when getting it involves either leaving the house or waiting a few days for it to be delivered. But then, my well-intentioned plans were thwarted. 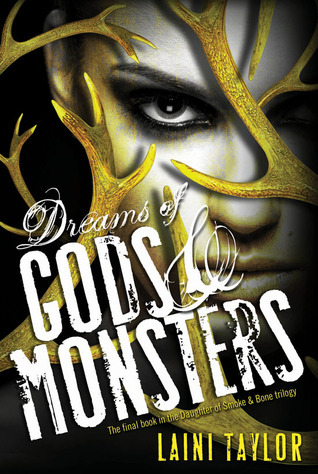 Because I realised that Dreams of Gods and Monsters (Daughter of Smoke and Bone No.3) was going to be released on 16th April. And having loved the first two books in the series, and having been waiting for it for ages, and having considered it to be my second most eagerly anticipated book of the year (No. 1 is Ruin is Rising), there was simply no way I wasn’t going to buy it on release day. Conveniently, release day pretty much coincided with the long Easter weekend, so I thought I’d be justified in losing myself in a book. And purchasing myself a shiny new Kindle Paperwhite. The review is below. In short, it was good, which is lucky, as it’s so long that reading it took up a good proportion of that weekend! I hugely enjoyed the first two books in this trilogy. If you’re reading this review, I bet you did too, and I bet nothing I could say could put you off buying it. I absolutely couldn’t wait to read it, and on the whole, this final book doesn’t disappoint. All the old characters make a return, along with some interesting new ones, and both the war-focussed and the romantic plotlines are satisfyingly resolved. This is an extremely long book (I read it on my kindle, but the hardcopy must be around 600 pages), but between the intriguing plot, engaging characters, and strong writing style, it never dragged – though I found it to be slightly less of a page-turner than the previous instalment. This series has always trod a strange line between YA paranormal romance/urban fantasy, and the sort of full-blown high fantasy that George R Martin would be proud of.For me, the first book fell more into the former category, especially towards the end, while the second book prioritised war and history over forbidden love. This instalment falls somewhere in-between, combining scenes of relatively normal life on earth with full-scale battles in another world. I enjoy both of those genres, but I prefer this series when it focusses on the latter, and gives the reader strange creatures and conspiracies in other worlds rather than concentrating on the romance between an angel and a (more or less) human girl. For some reason, the relationship between Karou and Akiva doesn’t do much for me. He doesn’t capture my imagination, and they never seem to have much chemistry. Things were better in Book Two, when there was real tension and distance between them and I started to warm to their story, but here, the author seemed to be manufacturing reasons to keep them apart, and it didn’t really capture my imagination. It’s odd, because the relationship between the two supporting characters, Mik and Zuzana, is always both touching and funny, and a new cross-species love affair that sprung up in this book really touched me too. The more fantastical side of things continued to be very well done. We get more history, more folklore and more of the ongoing war between chimera and angels, along with lots of internal conflicts within the two sides. We finally get to see the Stelians, a different race of angels with a totally different culture and history and different powers. There are all sorts of revelations and drama. With the new ruler of the angels “off-screen” for 95% of the time and the White Wolf dead, it sometimes felt like we were lacking an immediately loathable villain. The latter really made the second book for me, so though I couldn’t regret his well-deserved death, I did miss his effect on the plot. That said, Ziri’s attempts to portray him to keep the army under control and the internal struggles it causes him were some of the highlights of the book. Generally, I really couldn’t fault the fantasy side of things. From reading some other reviews, I suspect I’m in a minority here, but one of my very favourite aspects was the completely new plot involving a genetics PHD student who has terrifying, literally heart-stopping dreams about the end of the world, in which the apocalypse is her fault, and who is hiding some initially undisclosed secret about herself and her family. The “what on earth is going on here” aspect of this reminded me of the sense of mystery I loved so much in the first book, when you didn’t know why Karou was collecting teeth for monsters. And when the answers were finally revealed, the backstory and revelations it led to were amazing. Overall, not quite a perfect book, due mainly to the sometimes lacklustre romance, but a really fantastic one all the same, and absolutely worth a read. A fitting end to a great series. It’s been far too long since I’ve taken part in Top Ten Tuesday, (see http://www.brokeandbookish.com/p/top-ten-tuesday-other-features.html) but I’m excited to have such a good subject to work with this week. I suppose unique books is a little ambiguous, but I’m mainly thinking in terms of structure and style rather than plot. If there’s one thing I really and truly love, it’s books that are written in an unusual way, be it a non-linear narrative, multiple points of view, or something even stranger. Many of my all-time favourite books fall into this category. Of course, if it doesn’t quite work, the result can be awful, but I still respect authors who give it a go. 1) Cloud Atlas – David Mitchell – Five short stories (each written in a wildly different style and genre, and spanning centuries) are interrupted halfway through by the next story. Each protagonist is reading the previous text, may or may not be the reincarnation of the previous hero or heroine, and is interrupted at the same point as the reader. In the second half, the protagonists resume their adventures an their reading, and we work our way back through time and through the story. In between all the cleverness of the mindbending structure is some seriously good writing and several engaging plots. As regular readers may have picked up, if I was forced to pick a favourite book, it’d probably be this one. 2) The Blind Assassin – Margaret Atwood – Parts of this story is the first person narrative of the eighty-something narrator. Other parts are her reminiscing about her childhood, the famous author sister who killed herself the day WW2 ended, and her unpleasant industrialist husband. Newspaper articles and other documents from the time about the three of them are interspersed. And every few chapters, we get The Blind Assassin itself – the science fiction novel that made the heroine’s sister’s name, which is itself a book within a book. The four (at least – it depends how you count them) aspects work together to tell the full story, and it results in a brilliant mash-up of contemporary, historical and sci-fi literature. 3) Sarum – Edward Rutherford – Sets out to tell the story of 10 000 years of human history via lots of interwoven stories featuring the same families and the same area (Salisbury Plain) over centuries. The scope is jawdropping, and somehow, the author makes you care about almost everyone of the cast of (probably literally) thousands. 4) What a Carve Up – Jonathan Coe – The hero is employed to write a history of the Winshaw Family, a clan of borderline evil aristocrats, by one of their members. Chapters alternate between modern day (well, early nineties) scenes of him researching, writing, obsessing over the eponymous film and being let down by the Government; some flashbacks to his younger years, and the story of each member of the family, told through diary entries, newspapers articles, and various other forms. And then from about two thirds in, the hero and the family meet, and things get very strange. It’s as laugh out loud hilarious, cleverly plotted, and viciously political. 5) Before I Go to Sleep – AJ Watson – I reviewed this only a few weeks ago. The main character wakes up each morning with no memory of the last few decades or real understanding of who she is. The story is told through the diary she has secretly begun to keep, and the fact that she (and therefore the reader) has no idea what is or isn’t true makes for a disorientating experience. 6) Gone Girl – Gillian Flynn – Obviously, this book has been wildly popular recently. For me, it’s not so much the (really rather far-fetched) plot that made me enjoy it, but the clever structure (and some great prose and killer lines). Chapters alternate between Nick’s (the husband) narration, starting with the day of his wife’s disappearance, and Amy’s (the wife) diary entries, dating back from the day the two first met years before, and gradually working up to a few days before her mysterious disappearance. The two storylines didn’t quite mesh, showing what a different perspective two people can have on the same event and keeping me guessing about what was really going on in the main characters’ relationship and what had happened on the day of Amy’s disappearance. 7a) Behind the Scenes at the Museum – Kate Atkinson – A chronological story of a girl growing up in Yorkshire in the sixties and seventies is interspersed with stories of her extended family stretching back to about 1900, and told out of order, so that the full picture only gradually becomes clear. 7b) Life after Life – Kate Atkinson – The above author’s latest book was a bit of a let down to me, though it’s received rave reviews from many people and is certainly both unique and ambitious. The heroine is born, and dies moments later, choked by her umbilical cord. She is born again, and lives for a few months. The book endlessly returns to the scene of the baby being born, and to numerous scenes of her death – as a baby, a toddler, a teen, an adult. From smallpox, accidents, violence, war. It’s never quite clear whether these are reincarnations, parallel lives, or something in between. 8) A Visit From the Goon Squad – Jennifer Egan – It may have won the Pulitzer Prize, but I just couldn’t fall in love with this. Certainly written in an unusual way though. It consists of several stories, spanning about fifty years, and each centring around a different character, although each of them have links to some of the others, and one seems to be the key connecting link. The stories are told out of chronological order, which makes for some thought provoking moments, and uses different styles, perhaps most noteworthily, the story told in PowerPoint slide format! 9) Room – Emma Donughue – Not one of my favourites, but certainly unique and memorable. It’s narrated by a five year old boy, who has been imprisoned in a single room ever since he was born to his kidnapped and raped mother. The fact that he believes the room to be the whole world, that he has his own names for things, and that he is utterly innocent about the horrors that are really going on makes for a truly unusual voice. 10) The Lovely Bones – the heroine dies (horribly) in the first chapter, and then narrates the rest of the novel from heaven. A little mawkish in parts, but a pretty clever concept. It’s once again time for that great Oxford tradition – the Varsity Boat Race. I think I said pretty much everything I wanted to say on the subject last year, but I can’t let the event pass unnoticed on my blog, so here’s last year’s entry again (slightly edited to reflect it not being Easter and there being a different team etc) in all its glory. And now I’m off to the river. Go Oxford! There’s lots to admire about the Boat Race. It’s one of the few genuinely big ticket amateur sporting events left. Although in practice both teams nowadays often contain a good few people who row for their country and are doing slightly suspect post-grad degrees, in theory I love the idea of normal students training so incredibly hard for their moment of glory, and you still always get a few rowers who genuinely fit that mould. Looking at last year’s Oxford squad, one is a doctor and one is a vicar – in what other sporting event would that happen? Despite all this, when it comes down to it, what I really love is the tribalism. I want Oxford to win to an extent that borders on the irrational. And that’s just the way I like my sport. As a rule, I love sport, but generally only if I have some personal interest in the outcome. Growing up in Sheffield, everyone was into football. You supported either Sheffield Wednesday or Sheffield United, and you did it wholeheartedly. I was (and indeed still am) firmly in the former camp, because supporting Wednesday was what my family did, going back several generations. On Steel City Derby Days (when the two teams play each other) the city wass like a ghost town. Everyone was watching, at the stadium, in a pub or at home on TV. There is no logical reason to love one group of footballers based in your home town and hate another group of them based in the same place, but there’s something oddly satisfying about doing so. It creates a real sense of belonging. Occasionally, in London, in the middle of a busy street or train, I’ve spotted someone in a Wednesday shirt and I’ve just had to go over and speak to them. In Sheffield, even the condiments come in team colours! So a few days ago, I announced that Ivory Terrors is now finished and will be published on the 1st May. As a little celebration, I’ve posted the first chapter (not including the prolgoue, which I’ll explain more about in a few days time) below. Enjoy! Harriet listened groggily to the voices around her. George’s aristocratic drawl and her mother’s clipped voice were unmistakable, though she struggled to understand what the latter had to do with George’s kidnap attempt. The other voice reminded her of her uncle’s broad Yorkshire tones, but that would make no sense at all. She tried to force herself into full wakefulness, but couldn’t quite make her eyes open. Harriet managed to open her eyes for a split second, long enough to tell that she lay in a narrow bed, with George leaning over her. She tried to speak, but George put his finger to her lip then touched his forehead to hers. A blast of mesmerism radiated through her and she blacked out again. “How long do you think it will be until Augustine realises we’re gone?” In the time that Harriet had been asleep, her mother’s tone had become more panicky. “From the alarms at the Party, I think he realised before we even made it to Richard’s jet. But don’t worry about that. Another hour and we’ll be at his stronghold, and even Augustine can’t reach us there.” Despite his reassuring words, George sounded faintly hysterical. Harriet tried to think logically about the situation. She’d been mesmerised into attending the Summer Party against her will. Nick had been turned and had tried to drain her, but she’d turned his mesmerism back on him. Then Rupert had forced her to wake Nick up by threatening Catherine and Katie, at which point, he’d killed Julia. Beyond that, things got hazier. George had lured her into the woods, and offered her revenge on both the Cavaliers and the Roundheads. She’d thought she could resist him, but when he kissed her, she’d let her guard down, and then he’d mentally knocked her out. She had no idea what George was planning or where he was taking her. She should have known better than to trust him even for a moment. But why was her mother involved? And who was the third person? She’d never heard a vampire speak like him before. Harriet understood the individual words, but the context barely made sense. His daughter? Augustine had claimed to be her father, but in her view, she only had one dad, and he’d been dead for years. Yet in her head, he always spoke like the stranger. Once more she tried to force her eyes open, desperate to see whether the stranger looked like the man pictured in her locket. “What do you know about this?” Augustine said. On the surface, the leader of the Cavaliers seemed to be as poised as ever, but Tom could sense the interior breakdown taking place under his calm facade. Rupert sprawled in a chair, pinned there not by ropes but by the sheer force of Augustine’s will. Caroline’s turn in the chair came next. One moment, she was clinging to Ben for dear life. The next minute, she sat in the hot seat. Vampires could only be mesmerised by their makers, but in this, as in so many things, the rules clearly didn’t apply to Augustine. Caroline, usually always so self-assured, started to cry before Augustine even began his interrogation. With a shrug, he released Caroline and she fell into Ben’s arms. Ben’s willingness to support Caroline after her weeks of absence made Tom smile even through his pain. In his experience, a crisis tended to reunite a couple like nothing else could. The wood, with all its torches and fairy-lights, blurred for a moment, and then Tom found himself in the chair. Augustine’s powers never failed to astonish him. “Do you know anything about this?” Far from tiring him, each interrogation seemed to increase the force of Augustine’s power. Katie dragged her shaking body out of bed. She wanted to sleep for a hundred years, but she had to get up and face the day. She resisted the temptation to run out onto the street, screaming about what she’d seen. The brain that had always plotted for the most prestigious internships and eligible men knew that that would be counterproductive. Go to the police with her hair wild, her make-up undone and her breath smelling of alcohol, and her story would sound like the ramblings of a madwoman. But have a shower, brush her teeth, put on her best interview suit and a subtle string of pearls, and maybe someone would listen. She forced herself through the old familiar routine of washing and preening, trying to get her story straight in a head that just wanted to break down. She wouldn’t use the term vampires, she wouldn’t. No one would buy that. She tried to think of the most rational way to put it. She’d been at a party. Some of the guests had bitten some of the others. Some of them had died. She’d been bitten herself, but she’d survived. Julia Jenkinson had died. Sofia Calvinos. She wasn’t sure of the other names. She downed a strong black coffee that did nothing to quell the tremors that had overtaken her, and then strode out of the door before she could change her mind. In the quad, she hesitated. It would be better if she had someone who could collaborate her story, but who could she ask? Caroline had stood there watching it all. Harriet had all but ordered Julia’s death. And her darling William, the nicest man she’d ever met, had plunged his teeth into her neck. No. She had to do this alone. The twenty minute walk to the police station seemed to take hours. Aside from the mental trauma, the blood loss had left her physically weak. Once she’d dealt with the police, she might just have to visit the hospital. When she finally made it, the young desk sergeant gave her a friendly welcome. Between her pretty face, her imposing voice and her obvious wealth, Katie generally expected people to treat her with that sort of respect, but today, his politeness hugely relieved her. The sergeant’s mouth fell open. He’d clearly been expecting her to report a stolen purse. Katie nodded and followed him in silence, still debating how to make her story sound sane. Someone fixed her a cup of tea, and then the man from the desk left. He returned a few minutes later with his superior in tow. “So you say you want to report four murders?” the senior officer asked, staring at her through narrowed eyes as though she were the criminal. Katie desperately tried to engage the young sergeant in conversation, but he wouldn’t look at her. After a few minutes, the other officer returned, accompanied by a severe middle-aged man, who waved the other two out. Josh stared at the news website, barely able to comprehend the words his eyes were seeing. The words swam on the page. His eyes couldn’t focus on anything but the picture of Julia the BBC had selected to accompany the news story. He recognised it as one that he’d taken the previous summer at the ball. They must have copied it from Facebook. She looked beautiful and fragile in equal measure. He wanted to close the page and pretend that none of this was happening. Instead, he clicked on the video news story. The presenter’s solemn words drifted over him. He reached into the top drawer of his desk and drew out a letter. When he’d found it in his pigeonhole a few days earlier, he’d considered it as a cry for help from a girl who seriously needed the support he so desperately wanted to give her. Now, it seemed all too prescient. He forced his attention back to the screen. A striking middle-aged woman with red hair, easily identifiable as Julia’s mother even without the caption underneath, tried her best to answer an interviewer’s questions through her tears. “It must at least be a comfort to you that she died saving someone else,” the newscaster said. The camera diplomatically panned away. Josh looked back and forth between the letter and the computer screen, unsure what to believe. The news report sounded a thousand times more likely than a gang of vampires. And yet, what were the chances of Julia predicting that she’d be murdered on a certain night and then dying in an unrelated incident? Besides, her strange behaviour over the last few weeks took some explaining. The news report went on and on, almost as if someone wanted to ensure no one had any questions in their mind about how Julia had died. Rupert appeared on the screen and Josh looked away. At best, Rupert had stolen Julia from him, at worst he’d done something terrible to her mind and probably been responsible for her death. He’d never wanted to hit someone so badly. Rupert looked artfully distressed, his stupid posh face arranged into a tragic frown. His stuck-up voice stumbled over some words as though he could barely control his distress. Josh had hoped that the filming was live, so he could see Rupert standing in the morning’s bright sunlight, and put aside the ridiculous idea of him being a vampire. There was no such luck. The news crew had clearly filmed his segment last night, soon after Julia’s death. Josh had seen enough. He slammed down the lid of his laptop before he put a fist through it. He read the last line of the letter for the hundredth time. Since he’d first heard the news, Josh had been too shocked to cry, but now the tears fell freely. He wanted to crawl into bed and never get back up, but that would be the ultimate betrayal. He’d do what Julia had wanted. He’d speak to Harriet, make her tell him the truth, and then get revenge. Good news! After a year and a half of frenzied planning, writing, editing, and proofing, I’ve finally finished Ivory Terrors, the third and final instalment of the Cavaliers Series. It’s 135 000 words long – nearly twice the length of Oxford Blood. And at it’s longest, it was closer to 160 000. I’ve had to do some really quite brutal cutting to make it readable. Never again will I attack my favourite authors for what I’ve always regarded as cardinal sins – taking ages to produce a sequel or writing a self-indulgently long volume. Because my goodness, it’s tempting. Knowing I will never write another full Cavaliers book (although one thing I’m considering as a future project is a book of historical short stories about different members in different time periods), I wanted to get in all the backstories, all the revelations, and wrap everything up nicely. And I hope that when you read it, you’ll agree that I’ve succeeded. I was always absolutely clear that the Cavaliers Series was meant to be a trilogy, and one thing I hate above all others is when authors drag series out beyond their intended duration. There may have been some twists along the route, but nearly everything that happens at the end of Ivory Terrors was meant to happen from the start of Oxford Blood – the reviews that wondered why Stephanie couldn’t be mesmerised in the prologue might finally get their answer. In particular, I’ve really gone to town on Augustine. It started out as a prologue about his turning, and ended up at something like 20 000 words giving most of his life story, across a variety of centuries. As a history graduate, I’ve always tried to infuse the series with a historical flavour, but this is the first time I’ve gone full historical, and I hugely enjoyed it. It was also fun to take a character who has always been a bit of a cipher – almighty leader of the vampires – and imbue him with a personality and a past. Anyway, I’m now planning to publish the book on May 1st – as readers might remember, May Day is hugely important in Oxford, so it seemed fitting. I’m in the process of setting up a blog tour and some advance reviews – if you have a blog, have read the earlier book, and would like to get involved, please drop me a line. Finally, thanks to the surprisingly large number of people who’ve emailed me over the last few months to ask when Ivory Terrors would be ready. You’ve simultaneously made me feel horribly guilty that it’s going to be about five months later than originally promised, and yet so utterly happy that there are people who want to read my books that you’ve really inspired me to get it finished. Now I’ve finally finished, I’m hoping to be able to dedicate more time to my sadly neglected blog. So keep your eyes peeled over the next few weeks for soundtracks, a mini-series on the inspiration for my characters, and some Ivory Terrors extracts. And now, despite the fact that its Tuesday and I have work in the morning, I’m off for a Harriet-style glass of midweek champagne. Blurb below. Put May 1st in your literary diary, and treat yourself to a copy of the most ambitious thing I’ve ever written.